By Mid '62, Lupine had issued a couple of songs by the Fourmost and Gene Martin before bringing back the Saxi Kari orchestra to work with Ella Reed and The Conquerors. The Conquerors sides were "Duchess conquers Duke"/"Bill is my boyfriend". The top side was an answer song by a female group and swayed remarkably close to Gene Chandler's classic outing on Vee-Jay. The Ohio Untouchables had backed the Falcons on "I found a love" before they got their own chance on Lupine109&1009 and Lupine 110&1010. Strangely there had been an eleven month gap between these two 45's. Their first disc "She's my hearts desire" was written by Willie Schofield. The follow-up "Forgive me darling"/ "Love is amazing" were both written by Robert Ward who fronted the Untouchables. Publishers were Lupine-Thelma-Cotillion, underlining Robert's allegiance to Thelma on Dexter at that time. "Love is amazing", in my opinion, is the best song that West would ever release. It is an exotic, hypnotic masterpiece which never ceases to please and features Robert Ward's wonderful guitar playing and Bernie McCain's complementary vocals. Also featuring with the Untouchables at that time were Clarence Satchell on saxophone, Ralph Middlebrooks on trumpet and Marshall Jones on bass. One further 45 would be released on the Untouchables and it was "I'm tired" from February 1964. 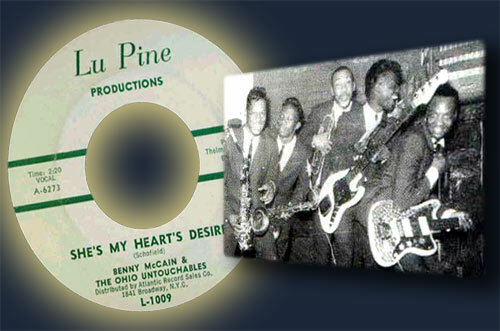 Almost a decade later Satchell, Jones and McCain would form the nucleus of the Ohio Players.